Ok everyone here is my how to, its simple and does not take much time to do. Before you start this remeber this is only a how to, I nor this bourd will be responsible for the outcome of this project. Use safty equipment when applicable. Do not remove the hood at this time. First you will notice the hinde assembly is way to long for the Mazda, measure drip rail to drip rail. I went off one of the fender bolts, why becuase it is right in the middle of the fender. After you have this measurement you will want to measure the hindge assembly rail, minus the diffrence in size from drip rail to drip rail from the hindge and you have the amount it needs to be cut. Cut the lenght from the middle of the cross bar on the assembly. Dont weld it up until you have had all the holes marked, this will allow you to work easier. This is a great time to go get the middle connector if you dont have a welder, just take the cut piece to home depot and find the connector that fits perfect. Next step is cutting the core support, I know ahhhhh right, no its nothing big. You will see were it rounds to the fender, mark and cut both sides. 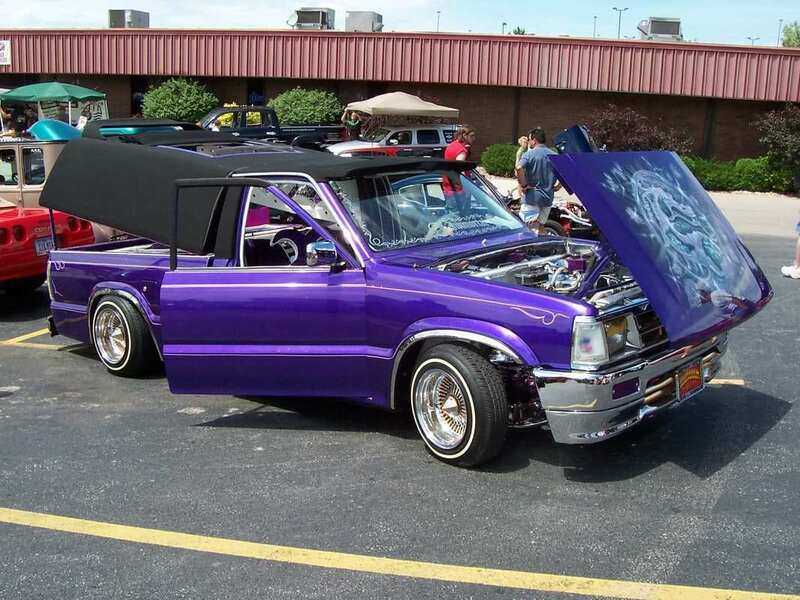 If you dont the assembly wont move all the way foward anfd the hood will open right on to the fender. Using the hindge assembly place on fender in the open position move fowrad until the hindge assembly is right up against the core support, using a sharpy mark a line before and after the hindge, repet other side. After that is done you use a pice of card bourd to mock the mounting bracket for the hindge assembly. Simply trace out the out line of the mounting assembly and mark the mounting holes onto your card bourd, repeat for the other side. Using your scissors cut the shape out and pock into area were the mounting hole are on the card bourd., this will make it easier to get the hole lined up. Place the pice between the lines you made for the assembly,and mark. Now you can go weld the hindge assembly together. But remeber if you want to hev the ability to tilt to the side you will not weld the bracket. Using the pipe connector will allow the cross bar to connect to support each other but will also allow the hindges to act as its own, giving you the ability to tilt to the side. Drill the 2 holes out on the fender and using the bolts, washers, and nuts, place one washer on the top and one on the bottom, and bolt the hindge assembly down. Taking the spring off the hindge assembly will help you move the assembly easier, simple use needle nose plyers, grab the top part and pull up and than down the spring should come right off. now you will want to move the hindge assembly to make sure it clears everything, by now you will noticde it hits the windshield washer fluir holder, remove and relocate. After making sure the hindge moves easy and does not hit anything, you are ready for the hood. Remover the hood, you will need a extra hand for this part. This is the part were measuring and being accurate is super inportant. I measured from the stock hood hindge to the first hole on the buick assemble. Then used that same measurment to go from the bolt on the hood were the stock assembly connected to the were the buick assemcly would mount, mark this and repeat for the other side You will have a good amount of adjustablility with the hindge assembly but do your best to be accurate as possible. so now your happy and excited becuase you are at the point were you can see your hood and flot it and suicide it, but theres still more work to be done. Just as you did the top you will want to drill and mount the body bolts to the retainer clip for the lower mounting holes on the hindge assembly. test the hood to make sure the hood closes lined up , dont worry about the back sticking up we will get to that in a minute. If shes all lined up yopu are ready to go to the next step, if not, losen the bolts a little and adjust till it closes perfectly. Now you will need to take off the cowl, and unbolt the assmebly that connect the stock hindges. and bolt re connect the cowl. Using the stock hindges cut them right before the mounting bracket for the stock assembly, not the hood, but the assembly under the cowl. repeat the same for the other side and bolt them up. This will secure the hood when its closed but will also slide out when you pull the hood foward. You can also use hood pins. By now your done, with just a few minutes of time adjusting you have completed the mod. Pat your self on the back......... have a cold beverage and grab a cam tak pics and post. what keeps this from bouncing around on the fenders? For my show truck, I created basically a flat bar attached to the hood in the stock location. 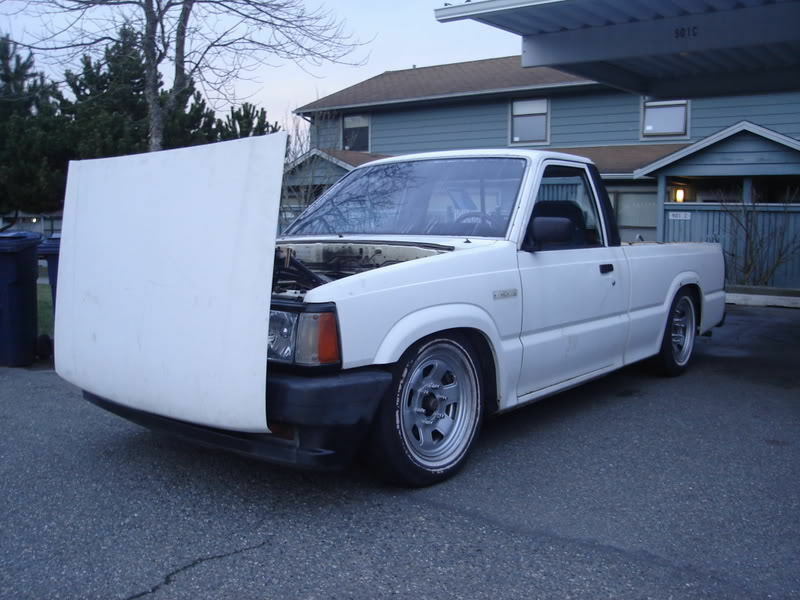 I slides into the slot left by the original hinge to keep the back of the hood from flopping around. The stock hood latch is also used in the stock location. Picture is the best I can do for the metal bar. i have some pix of what i did. i know immortal cut the rivet, and used a bolt to keep them together. i just ended up spacing mine down a little. will probably be tomorrow when i can get them up! Will this work with a body drop and some 18s? Or will the hinge hit the tire?